Traveling abroad? 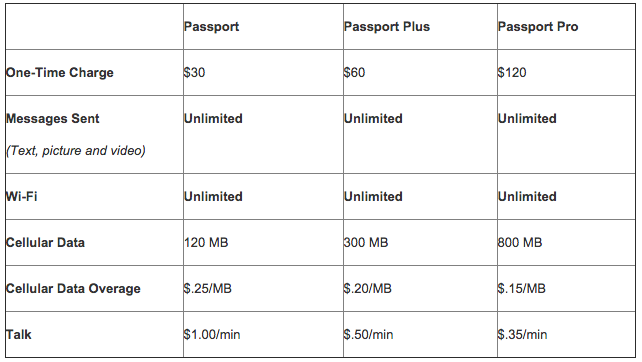 AT&T introduced three new international travel plans today, all under the name Passport. The plans, well, aren’t great deals, but they are the only options you have if you want AT&T service when visiting another country. The plans start at $30 per 30 days and go up to $120, depending on the type of service you want. The Passport ($30), Passport Plus ($60), and Passport Pro ($120) can be added to your current postpaid plan and expire in 30 days. In other words, you do not have to call AT&T when you return from your trip in order to make sure you do not get charged for another month of service. How nice of AT&T. The plans differ in price (obviously), but that price difference affects the prices you pay for data and calls when out of the country. With the $30 Passport plan, you pay a whoppin’ $1.00 per minute of talk and $0.25 per MB of data used over your allotted 120MB. With the Passport Plus, the talk price goes down to $0.50 per minute and $0.20 per MB, plus you also get 300MB of data to use up front. With the Pro plan, the talk price drops to $0.35 per minute and the data price to $0.15 per MB, while the data bucket maxes at 800MB out of the gate. We should point out that each plan comes with unlimited messaging (text, picture and video), along with unlimited WiFi access at “participating hotspots” in the UK, France, Germany, Japan, and Mexico.